The Marsh Christian Trust, in association with Wilton Park, have created this Marsh award to recognise an individual from outside the UK whose work makes an innovative difference to areas of conflict and peacemaking. We are very pleased to announce that this year it will be presented to the winner at this week’s Global Summit to End Sexual Violence in Conflict. Elizabeth Angok, Regional Director of Mother and the Child Care Organisation in Juba, was nominated following her participation at the Wilton Park PSVI conference in 2012. 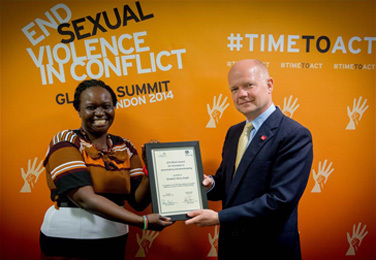 She is being awarded with an honorarium of £1,000 for her work in protection, prevention and securing health assistance and justice for victims of sexual violence in South Sudan. Preventing sexual violence in conflict and post-conflict situations in 2012 provided a forum to identify where global leadership on this issue could make a difference. This supported the UK initiative to quash the culture of impunity by bringing more perpetrators to justice, strengthen international coordination and support nation states in building capacity to address sexual violence. In addition, Ja Nan Lahtaw, Director for Programme and International Relations for the Nyein (Shalom) Foundation, a national peace non-governmental organisation in Myanmar, has won an exceptional prize of £250. Miss Lahtaw attended our most recent conference on Women in peacebuilding, which sought to identify lessons from past efforts and the UN Secretary-General’s 2010 seven-point plan on Women’s Participation in Peacebuilding, energising the agenda with concrete actions for the future. Wilton Park is very proud to be able to recognise the work of both these individuals and their efforts to alleviate the suffering caused by sexual violence in conflict.